How old is my Pachinko Machine? Determining the exact year of manufacture of a pachinko machine can be a daunting task. The machines do not have year stamped or printed on them, so it will often take a bit of detective work. With a little diligence you can probably make a pretty good estimate. The first thing to understand is that unlike automobiles in the US, there were no real "model years" for pachinko machines. When a machines was ready for production, they produced it, and continued to produce them until sales declined to a level where they were no longer worth producing. A particular model might be initially produced an 1973, but still see limited continued production for several years after if it is popular. Collectors are not generally concerned with the particular year a machine was made, but rather tend to consider all of the same model as being from the first year of production. Manufacturers might introduce several different models in a single year, with only one of them continuing to be produced in the next. So the challenge is to try to determine the first year of production for a particular machine model. Below are a few methods that can help you. The first method most people use is to examine what are commonly called the expiration tags. These tags or stickers will be affixed to the playfield, either by glue, a small nail, or a staple. These are actually certification stamps that the Japanese Gaming Authority would affix when they were installed in parlors. They have been called expiration tags for decades by hobbyists, so we will retain that somewhat innacurate nomeclature. 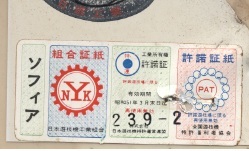 The date on the sticker is typically one year later than the date of manufacture, because that was the period when the majority of a particular model was sold and certified. Many pachinkos have lost the tags, and some types do not display a date. A good number of 1950's and 1960's machines had small triangular stickers that clearly indicated the patent date in western characters such as 1964. These tags are typically refered to as patent tags, and should not be confused with expiration tags. These antique pachinko machines would normally have an expiration tag as well. 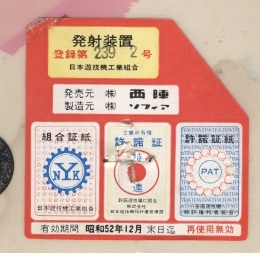 Later rectangular and circular tags show the year the machine was certified by using the Shōwa year. You may find the numbers 49 and 6 in small font on a sticker for example. The 49 is not 1949, but the Shōwa year 49. The conversion is simple. Add 1925 to the number. In this case, 1925 + 49 = 1974, so the tag indicates 1974. That means the machine was likely manufactured in 1973. The second method is the playfield. Each year the Pachinko manufacturers would design a small number of playfield graphics (usually 6 or less) for that model year. If you know what playfield graphics were available in a particular year, you will know the manufacture date of the machine. Of course, each manufacturer had their own graphics, so there are literally thousands of background graphics. The good news is that playfield graphics were never used for more than one year. Additionally, many playfields come with ID numbers in the lower left of the playfield. For example, on a 1973 Nishijin you may find 48S-D in the lower left in orange. The 48 is the Shōwa year, so you know it was manufactured in 1973. The S indicates that this playfield is for Shōwa year and the D indicates which of the six backgrounds it is. In this case, Nishijin had 6 background for Shiroi Kamome machines in 1973, A through F. In 1974 they produced 6 backgrounds that were labeled 49S-01 thru 49S-06. There are a variety of playfield graphics code schemes across the various manufacturers, and some did not use any at all. There exist some exceptions, odd machines that that were clearly built with the components from one year but with the background from a later year. If a machine model was popular and was manufactured for several years, they might run out of background graphics for that year and use newer ones for example. A third method is to look at the features of the pachinko machine and compare it to the information found in 'History of pachinko' section of this website. For example, if the machine has tulip-style ball catchers, it was probably produced in 1960 or later. A fourth method would be compare to pictures of pachinkos with known manufacture dates. This can sometimes be difficult as so many manufacturers produced so many different models, but sometimes it can get you the information you need. Check the 'models' section of this website and maybe you will get lucky! Lastly, if all else fails, ask around! Post up some pictures on the pachitalk forum, and hopefully someone there can help you identify your tough-to-date pachinko machine!